Q: How do you make the weather instantly shift from warm summer to chilly fall? A: Pack up everyone's long pants and jackets, seal the boxes with tape, and stack them under four cartons of books. The packing is going moderately well. I wanted to share this new tip for moving soft things like pillows. We've long used heavy-duty trash bags for packing. In fact, think I arrived at college with everything I owned stuffed inside them. (Let me tell you, not a good way to make the sorority short list!) What always happens is that I can never figure out what's inside or unknot the ties; I end up ripping holes in every bag upon to find what I need. This time I'm using huge, clear plastic bags instead. Not only do they hold more, but you can see exactly what's inside. They're sold in a janitorial supply store for use in offices. You can buy a large amount for the cost of two boxes of lawn-and-leaf-size Hefty's. If I'm lucky, we'll see if they can even be reused for their intended purpose post-move. But you do not want to use the clear bags to declutter your children's rooms before donating to the thrift store. I did this when we moved. I used the huge contractor bags, clear of course, for things like pillows and comforters, as you said. I also HATE washing EVERY dish post-move, so I used some taller thinner boxes, lined with these bags & was able to stuf them with pots & pans, bakeware, some of the larger items. 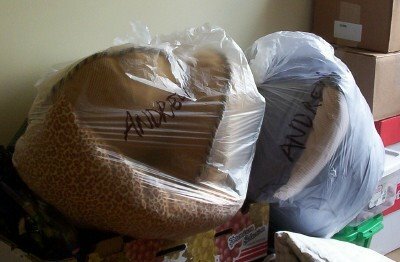 Bags of blankets and things are also wonderful for stuffing the little nooks and crannies and for cushioning furniture. I used large clear rubbermaids and linens to wrap and pack my plates and such. This actually kills THREE birds with 1 stone- clean linens AND dishes & I know exactly which "box" to find (after all, BIG difference between plastic and cardboard).